In the present times, however, it is not just Balochistan which has the separatist sentiments, but Sindh under the leadership of Mr. G.M. Syed, has also been fighting for independence soon after the creation of Pakistan. From the platform of various nationalist political parties, Sindhis demand separation from Pakistan and creation of proposed, Sindhudesh, the Land of Sindhu (River Indus). They support their demand with the arguments that, 1., the British had invaded the independent Sindh and, 2. that they have a distinct rich history and secular culture which dates back 5,000 years. Before 1843, Sindh had, as a sovereign state, signed a treaty with the British Raj, allowing the latter’s ships to pass through the River Sindhu. The Raj, in return, had to pay taxes to the Sindh government. Karachi port and the Indus River had thus served as an important route for the British army in their war in Afghanistan. When the British left India creating separate states namely India and Pakistan, Sindh had joined Pakistan on conditions mentioned in the Lahore Resolution of 1940, the base document for the country’s creation. However, since the conditions were not fulfilled, Sindh argues, they have a moral and legitimate choice of withdrawing from being part of the Pakistani federation (also part of the said resolution). Pakistan celebrates the 23rd of March every year to commemorate the event. Mr. Syed was the first to move the resolution in favour of the newly proposed federation, Pakistan, in the Sindh Assembly for the first time; ironically enough, he pioneered the Sindhi separatist movement calling out for complete independence of Sindh soon after the proposed country was created. 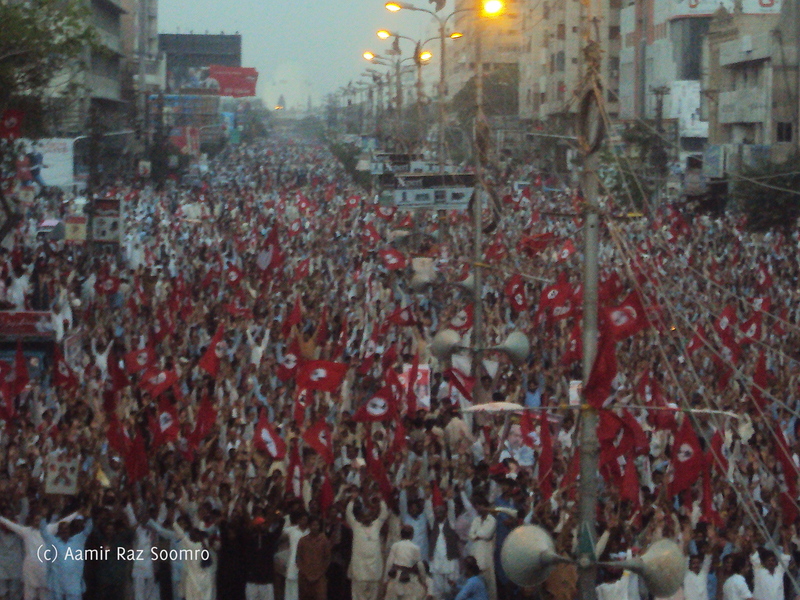 @AKchisti: “Thumjo desh, Mujho desh, Sindhudesh, Sindhudesh” at 23rd March at heart of #Karachi. The rally, titled the Freedom March, was quite an impressive crowd (considering it was anti-state and was being held in Karachi (Sindh), the most important city of Pakistan, which has gradually become more of an alien land to Sindhis after the creation of Pakistan 1947) and was organized by the Jeay Sindh Qaumi Mahaz (JSQM), one of the biggest Sindhi nationalist parties. Being an eye-witness of the event, I followed the event and live-blogged it on Twitter. Here is the view of the crowd. Where representatives of many media sections were present and were covering the event live, the news was either blocked or under-reported in the most mainstream electronic Urdu media channels. Sindhian Paraan karachi mein Big show karre 23 March wari Qaradad khe rad kayo wayo..per Urdu ain english media coverage mein total Blackout karre cahdiyo…..Sindhyo Jaaago.. The rally was so massive that it was sure to disturb the city’s normal traffic routes – major arteries witnessed sever traffic jams at the time the Freedom March rally passed through. On the one hand, this massive show of rejection of the Lahore Resolution, which means blatant rejection of Pakistan, was well received by those pro-independence Sindhis; on the other, it boggled the opponents of the Sindhi nationalism and the Pakistani state. And, that’s why, conspiracies followed to defame the rally soon after it culminated, and media reported MQM chief Altaf Hussain saying that people stuck in the traffic jam were looted by the participants of the Freedom March. However, the news could not get much importance and was soon ignored by the Pakistani media as well, although Mr. Hussain even reached out to the President of Pakistan to take notice of the issue. He did! According to Sindhi press & a news story in daily Times, hundreds of thousands of people participated in the Jeay Sindh Qaumi Muhaz (JSQM)'s “Sindh Freedom Rally” in Karachi today. It was no doubt a major event in Pakistan where a nationalist party gathered the people in large numbers & called for independence of Sindh. It was historic event. But the so-called national media is seen to have ignored or downplayed the event. Some media has even given it a negative look. This must be strongly condemned. Mr. Bashir Khan Qureshi, chairman, JSQM, made the major speech at the Freedom March and claimed that he entire Sindhi nation was with him when they demand independence from Pakistan. He said that Sindh had joined the federation of Pakistan based on the Lahore Resolution, which states that the joining states, including Sindh, would be sovereign and independent. Mr. Qureshi also quoted that Sindh contributed to the 80% of the total federal budget including 69% of natural gas and 75% of oil in the country. What it gets is injustice. This was his clear message. The main points of his speech included that Pakistan had become an “icon of religious extremism and terrorism”, where the Sindhis are ‘peace-loving’ nation believing in ‘religious coexistence’. Calling upon the international community, he put forward the 5-point agenda and requested to help Sindh and Balochistan get independence from Pakistan which, according to him, is their right by all standards. Nevertheless, the newspapers of the next day, i.e. March 24th, carried a good coverage of the JSQM's freedom march, both, in paper and online. Not to mention the strong coverage by the Sindhi channels and newspapers, reports by The Express Tribune, Daily Times, Pakistan Today, and BBC Urdu are worth noting here. Sindhis must take their own destiny in their own hands! How long will the gregarious people of glorious Sindh continue wearing ignominious fetters of serfdom and servitude? How long will Sindhis keep on tolerating the demeaning chains of slavery around their necks? 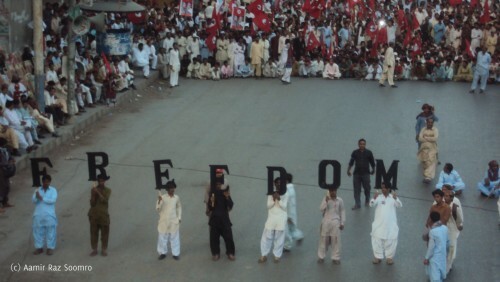 Today, Sindhis demand nothing but Freedom, Liberation and end to tyrannical occupation! Freedom of Sindh at all costs! Long Live Sindh. I share the nationalists’ call for Sindh’s independence. We have seen too much Punjabi and Pathan’ threat, usurpation of our resources, and control of our destiny. My hope is that the country of Pakistan will fall apart on its own under the debt carried by the Government of Pakistan for all its projects in Punjab. If that does not happen, I encourage the US, EU, and India to respond to the call of Sindhis and Balochis sooner than later. Dr. Ahmed Makhdoom – Very nice response., Even, we all want Sindhisthan to be as a separate country, and as everyone know Sindhis are the Best Businessmen .., Govt. should support us !!!!!!!!!!!!! Sindhis Need Freedom!!!!!!!!!!!!!! !